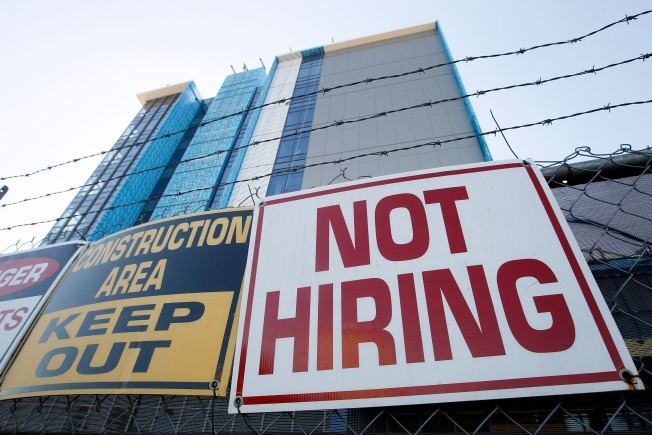 In this Nov. 4, 2010 photo, a sign turning away potential job-seekers is seen outside of a construction site in New Orleans. Employers added the most jobs in five months in October, with the education and health care sectors leading the way. After a long stretch of subpar job growth, businesses may finally be getting back in a hiring mood. The better-than-expected showing from Friday’s employment report for October was a welcome sign for job seekers and policymakers in the White House, Congress and the Federal Reserve. Businesses added a better-than-expected 151,000 jobs to their payrolls last month, the first monthly increase since May. That fell short of the 200,000 or so needed to keep up with the growth of the work force and start rehiring the 15 million unemployed Americans sidelined in the worst recession in 80 years. The unemployment rate remained stuck at 9.6 percent. "To bring unemployment down to 9.2 percent in a year's time, this economy is going to have to grow at about 4 percent. And right now it's growing at almost half that pace," said John Ryding, chief economist at RDQ economics. A pickup in hiring typically lags the end of a recession because employers want to see sustained growth before committing to take on workers. That’s one reason there have been strong gains in hiring of temporary workers in recent months. In October, the average number of hours worked continued the upward trend that began a year ago. If that trend continues, those extra hours eventually turn into fulltime jobs. The pent-up demand for new hires can also be seen in the steady rise of productivity gains, as employers continue to squeeze more work out of the same number of employees. In the third quarter, productivity rose at a 2.5 percent annual rate. Those gains have slowed in recent quarters, suggesting that it will be harder to keep boosting output without hiring new workers. Some sectors are faring better than others. Though private employers added 159,000 jobs, the government sector lost another 8,000 jobs in October. Deep cuts in state and local budgets have forced layoffs of some 460,000 workers since April 2009. Wide budget gaps are expected to continue to force deep cuts by state and local governments for at least the next two years. Strong support for federal budget cuts in the midterm elections could expand layoffs to federal workers. To try to boost economic growth and spur more hiring, policymakers at the Federal Reserve this week announced a widely anticipated move to buy back another $600 billion of government bonds — adding to a stockpile of $1.25 trillion worth of bonds taken on since the financial panic of 2008. The Fed is hoping that by soaking up more government debt, and replacing it with cash, the cost of borrowing will fall further and businesses and households will be more inclined to spend, boosting economic growth. That could be a stretch, according to David Rosenberg, chief economist at Gluskin Sheff, given the deep problems in housing, with some one in seven mortgage holders either "in arrears or in the foreclosure process, and an estimated 25 percent of homeowners are ‘upside down’ in their mortgage," owing more than their house is worth, he wrote in a research note to clients. Part of the problem is that despite the central bank’s efforts to flood the system with cash much of it is sitting in swollen corporate balance sheets and in bank vaults at the Fed. The Fed’s unprecedented bond-buying spree also raised concerns about its eventual exit strategy from a monetary policy that’s never been tried before in the U.S. At some point, central bankers will have to begin selling off the Fed's bloated portfolio of bonds, which would lead to tighter credit. It’s far from clear how the Fed will gauge the timing of those bond sales. Uncertainty surrounding key government economic policies has also weighed on the job market; business leaders have complained that they are reluctant to hire more workers until the costs of health care reform and the direction of tax policy become clearer. Tuesday's midterm election, which gave control of the House to Republican opponents of health care reform and supporters of extending tax cuts, has intensified that debate. President Barack Obama signaled this week he is open to compromise on a tax policy standoff that forced the debate into a post-election lame duck session set to begin Nov. 15. The Bush administration’s tax cuts expire at the end of this year. The hope is that more clarity about government policy, and more evidence the economy is growing, albeit weakly, will help change hiring managers' expectations about the future and give them more confidence to begin hiring again.